Euless, Texas is one of the Mid-Cities between Dallas and Fort Worth. Much of its recent growth can be attributed to the Dallas-Fort Worth International Airport, which is partially within the Euless city limits. Despite its current population of over 50,000 people, Euless started out as a small agricultural community, centering on land originally bought by Elisha Adams Euless. He started a cotton gin and later built a community center on his land. He was a very popular figure in the area and was elected county sheriff twice. The community recognized his contributions to the area, and Euless became an official city on February 24, 1953. Despite its location near a huge international airport, Euless still tries to maintain a small town feel and is proud of its history. Heritage Park is part of the city’s effort to preserve its past. At Heritage Park, you will find several restored buildings, including the 1st brick home in the city, a log cabin built in the 1850’s, and a barn made from lumber from Camp Bowie after WWII. These can all be visited daily, along with the Euless Heritage Museum. Here’s some pretty cool drone footage from a youtuber here. Like most of North Central Texas, Euless lies in the humid, subtropical climate zone. Texans know that this means they get to enjoy mild winters, but also must endure hot, humid summers. While most residents don’t love the humidity, most bugs do. If everything is bigger in Texas, that also includes the pest population. Residents of Euless must deal with everything from ants and cockroaches to brown recluses and scorpions. In recent years, mosquitos have become a major concern, as illnesses like Zika and West Nile have continued to spread across the U.S. Cities all across Texas have started monitoring the mosquito population in hopes of ensuring the safety of their residents. Another major player in the pest population of Euless is bedbugs. Bedbugs have made a big comeback in recent years and are known for hitchhiking in people’s luggage when they travel. The city’s location near one of the busiest International airports in the United States means that infestations have become more common in the area. Luckily, residents of Euless have access to exceptional pest control. At Vinx Pest Control, we are committed to using the best products that are long-lasting and safe for your family, hiring only the best technicians, and offering the best guarantee in the industry. If you aren’t satisfied with our service, we will come back and make it right. We know that every area and home has unique pest problems, so we customize our treatments to work best for you and your family. 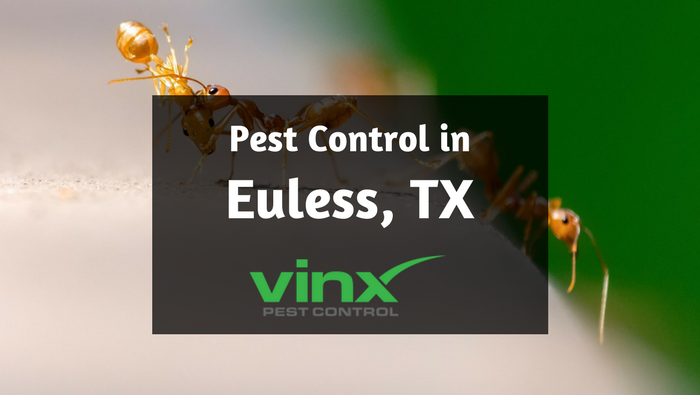 If you are in need of Euless pest control, give Vinx Pest Control a call today!